Families Of Japanese Abducted By North Korea Hope For Help From Trump : Parallels In Tokyo, Trump met relatives of Japanese citizens taken by North Korea in the 1970s. A handful have been freed over the years, but families are divided over the best way to gain release of the rest. President Trump, standing with his wife, Melania, and Japanese Prime Minister Shinzo Abe, speaks Monday in Tokyo at a meeting with the families of Japanese citizens abducted by North Korea. At center rear is Koichiro Iizuka, whose mother, Yaeko Taguchi, was abducted by North Korean agents in 1978. 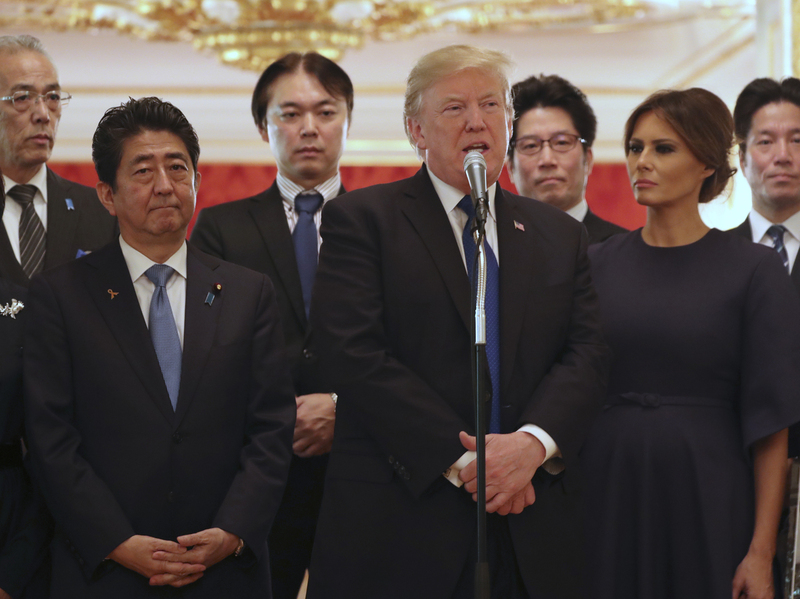 During his visit to Tokyo on Monday, President Trump highlighted a dark moment in Japan's history when he met with families of Japanese citizens kidnapped by North Korean agents. In the 1970s, North Korea abducted at least a dozen Japanese citizens and took them to Pyongyang to train North Korean spies in Japanese language and customs. One abductee was 13. "I think it would be a tremendous signal if Kim Jong Un would send them back," Trump said at a news conference with Japanese Prime Minister Shinzo Abe after the meeting. "That would be the start of something I think would be just something very special, if they would do that." Koichiro Iizuka, one of the relatives who met with the president, was a toddler when his mother dropped him off at day care. She never returned. "I'm turning 40 this year, and for 39 years, I haven't seen my mother. I have no memory of my mother," Iizuka said. For years, he and other family members of kidnap victims had no explanation for what happened. Finally, in 2002, North Korea admitted it operated a state-sponsored abduction program, confirming it had taken Iizuka's mother and other Japanese citizens. "I understand that for people who aren't familiar with the issue, it is an abnormal, unbelievable situation. It was like that for me in the beginning," Iizuka said. The Japanese abductees — mostly young people — were taken to North Korea and forced to train North Korean spies so those spies could more easily infiltrate Japan. "It's not just a Japanese problem," said Stephen Nagy, who teaches international relations at Tokyo's International Christian University. Pyongyang has also kidnapped South Koreans, Europeans and Southeast Asians for the same purposes. But, Nagy notes, "Where it's more sensitive in the Japanese case is the Japanese nationals have a sense of 'we're all Japanese' and that when a Japanese is not brought home to the homeland [and] put in the ancestral grave, there's a sense of detachment, a sense of amputation," Nagy says. Iizuka believes his mother is alive and continues pushing for her return. He has pressed the issue with a succession of U.S. presidents, including Trump on Monday. "We are speaking to the most influential figure in the world, and we ask him to speak on behalf of Japan and put pressure directly on Kim Jong Un for us. That is our hope," Iizuka said. 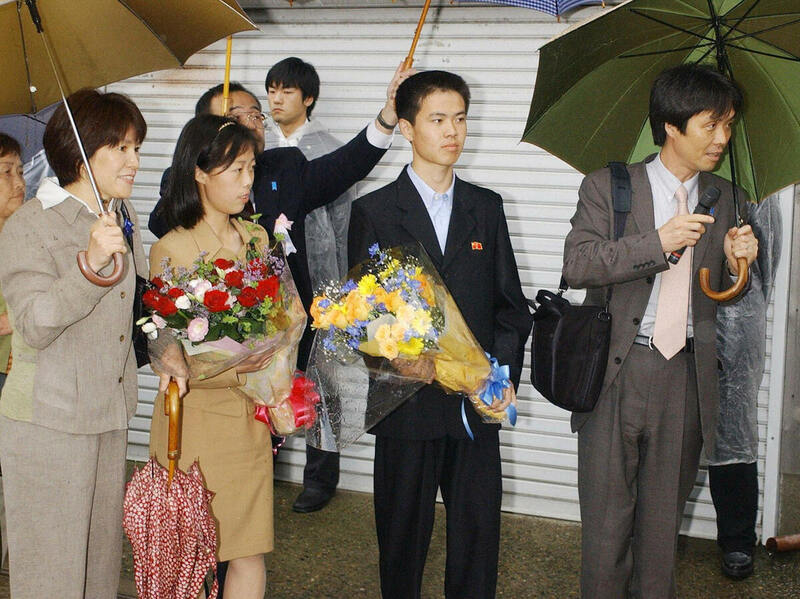 Former abductees Kaoru Hasuike (right) and his wife, Yukiko (left, holding umbrella), arrive at their home northwest of Tokyo with their two children (holding flowers) in 2004, after Japan won their release from North Korea. But because tensions are running so high with North Korea, other relatives of abductees aren't so hopeful. Toru Hasuike's brother Kaoru was also taken in the 1970s — and is one of the handful of abductees whom North Korea did return. He came back in 2004. Hasuike says his brother lives in freedom now, but because so many other Japanese are still held in North Korea, he doesn't feel free. "There are these people who haven't come back," Hasuike explains, "so he has to think about them and what will happen to them and how his actions will affect them. So he is not mentally free. He is carrying them on his back until they all come back." Hasuike advocates direct talks with North Korea instead of economic and military pressure. "I'd say don't get in a war with these people," he says. "Negotiate." The latest moves by the Japanese and U.S. governments are going in the opposite direction. Communications have gone cold after numerous nuclear provocations. Nagy says the situation has opened up divisions among the abductees' families: Is ratcheting up pressure on the North going to get their loved ones home? Or is diplomatic engagement the safer route? "Politicians have instrumentalized the kidnap victims in many different ways," Nagy says. "There's an interaction here between the international politics and domestic politics in both countries." Some four decades after the Japanese were kidnapped, Iizuka says time is working against them. "The only resolution to this is to have the abductees returned to our country. That has not happened. This issue is all or nothing," he says. He and the other relatives don't agree on policy, but they do agree on their goal. Becky Sullivan, Jake Adelstein and Mari Yamamoto contributed to this story.